I didn't know there was an English translation of this book until I just came across it. The original title is Een Schitterend Gebrek. It was one of the books I read for Dutch literature, a while ago, and I remember there were a lot of people who liked it, but I didn't really. 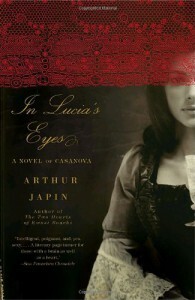 In Lucia's Eyes tells the story of Casanova's first love, Lucia. She runs away from her fiancé after a disease leaves her face scarred. Years later she finds herself in Amsterdam. Like I said, it didn't work for me. I thought the story was too slow and I didn't like Lucia, the main character. It is a shame, really, because when I see the author on television I always feel like I should read more of his books, but when I then think of this book I don't really want to any more. I think it just wasn't for me.